The Community Reinvestment Act Notice must be posted in the main lobby of banks with federally-insured deposits. There are different notice requirements for main offices and branch offices. 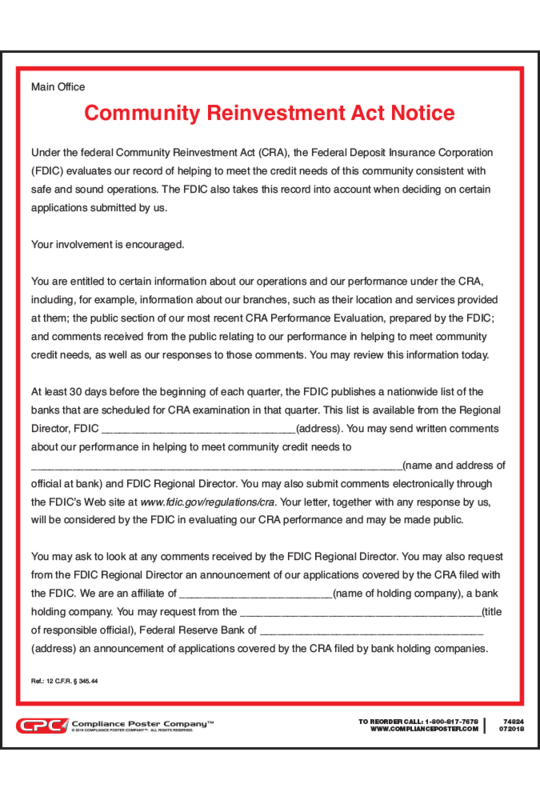 The Community Reinvestment Act Notice informs members of the public about the provisions of the Community Reinvestment Act (CRA), including the community’s right to certain information about the posted bank’s operations and performance under the CRA and the services offered by its branches. The CRA is a civil rights law that encourages banks to serve the needs of local communities, including low- and moderate-income neighborhoods and individuals. Community members are entitled to review the public section of the bank’s CRA performance evaluation, comments received from the public, and the bank’s response to those comments. Please note: this the Federal Deposit Insurance Corporation (FDIC) notice. Banks evaluated by the Federal Reserve Board (FRB) require a different CRA notice to remain in compliance. The Community Reinvestment Act Notice must be posted by state nonmember banks with federally insured deposits, including insured state branches. (12 C.F.R. § 345.44; 12 C.F.R. Part 345, Appendix B). The Community Reinvestment Act Notice for Main Offices (#74824) must be filled in and posted in the public lobby of the bank’s main office and, in the case of an interstate bank, in the public lobby of one branch office in each state. The Community Reinvestment Act Notice for Branch Offices (#74825) must be filled in and posted in the public lobby of each branch office.